Continuing from delighting in our garden plant life to exciting adventures with the animal kingdom that share our wonderful world! April had been an extraordinary month for me as I undertake to capture images of the many visitors to our garden. Of particular interest to me are the birds, butterflies, bees, dragonflies, snails, wasps and others. 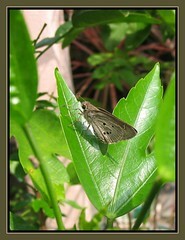 They follow their wild instincts and are attracted to whatever can be found in our garden. Birds seek fruits and insects seek nectar and we the generous providers! 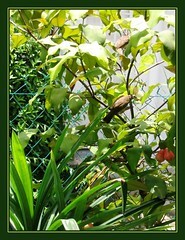 ;) How blessed we are to get them frequenting our tropical garden! How awesome it’d be if I could catch an image of these frequent visitors as keepsakes, I often pondered! I had passionately longed to capture a butterfly picture for a long time having seen such wondrous beauty of their pattern, colors and forms on online photosharing at Flickr and Moosey’s Gardening Forum. 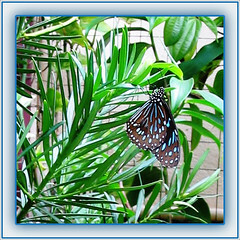 And God answered my wish on April 5 when I finally succeeded to get a shot of an absolutely gorgeous Blue Tiger butterfly. Oh, what absolute bliss! 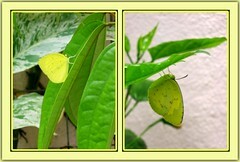 And what a joyous butterfly adventure I experienced that day, as journaled at my other blog! I’m so happy and thrilled as pictures of three other varieties were added to my photo album as the weeks rolled in! I realized that the subsequent captures were easier as I learnt to dance and rest with them! Hope you enjoy these shots as much as I do! 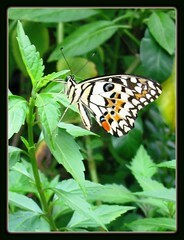 :) My next challenge is to capture butterflies with their wings fanned, displaying all their stunning beauty. This is one tough job because I’ve never seen it pose that way long enough for me to have even a quickie! More joyful adventure with the animal kingdom continued as I seek them out throughout this glorious Easter month! And with excitement and wonderful anticipation, I even managed to capture images of the White-browed Yellow-vented Bulbuls that almost emptied all the Java Apples (Eugenia javanica) at our backyard! A win-win situation where I sacrificed these thirst quenching fruits and they in return posed for me. ;) It had been a wonderful learning and discovering experience with these lovely birds, almost always flying in as a pair! Fun really as I observed and monitored their habitual visiting times and listened for their wabbling sounds to alert me that they’re near and get ready my camera (though too often they’re chased off by my hurriedness and excitement!). 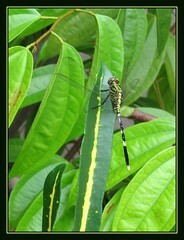 Here’s sharing too my first ever picture of a beautiful dragonfly taken around midday in our garden, resting on a Croton leaf! This dragonfly was easily photographed as it stayed still for quite sometime at one spot, just perfect for an amateur photographer like me! 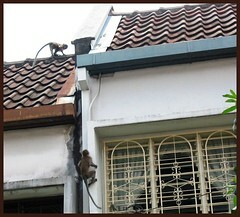 Finally, a pair of jungle monkeys that came to our backyard sourcing for fruits were chased off by our barking pet dog, sending them scurrying up to the rooftop of our back neighbours’s 2-storey link house!